If the West Antarctic Ice Sheet collapses, as many experts believe it will because of global warming, the resulting sea level rise will be significantly higher than is currently projected, a new study published in Science has found. Already projected to average between 16 and 17 feet around the world, the new figures suggest the rise would likely be almost 21 feet in such places as Washington, D.C. Many coastal areas would be devastated and much of Southern Florida would disappear. The problem with the previous set of figures, says Clark, is that they do not consider several key forces, such as gravity, changes in the Earth’s rotation or a rebound of the land on which the massive glacier now rests. Currently, the ice sheet has a huge mass, towering more than 6,000 feet above sea level over a large section of Antarctica. This mass is sufficient to exert a substantial gravitational attraction, the researchers say, pulling water toward it – much as the gravitational forces of the sun and moon cause the constant movement of water on Earth commonly known as tides. And aside from incorporating the gravitational effect, the new study adds further wrinkles to the calculation – the weight of the ice forcing down the land mass on which it sits, and also affecting the orientation of the Earth’s spin. When the ice is removed, it appears the underlying land would rebound, and the Earth’s axis of rotation defined by the North and South Pole would actually shift about one-third of a mile, also affecting the sea level at various points. A significant area of the concern is that much of the base of this huge ice mass actually sits below sea level, forced down to the bedrock by the sheer weight of the ice above it. 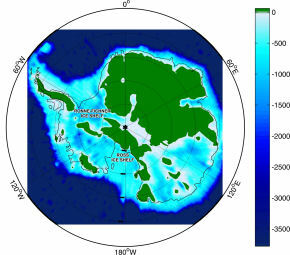 Its edges flow out into floating ice shelves, including the huge Ross Ice Shelf and Ronne Ice Shelf. This topography makes it “inherently unstable,” Clark said.